Lydia Syson, an English author, has penned a heart-touching tale of love set in Paris during the Civil War era, Liberty's Fire that unfolds the story of a young man and woman caught in the cross fire of country's war and politics try to hold on to each other despite their indifferences, the protests and the war. Paris, 1871. Four young people will rewrite their destinies. Paris is in revolt. After months of siege at the hands of the Prussians, a wind of change is blowing through the city, bringing with it murmurs of a new revolution. Alone and poverty-stricken, sixteen-year-old Zephyrine is quickly lured in by the ideals of the city's radical new government, and she finds herself swept away by its promises of freedom, hope, equality and rights for women. But she is about to fall in love for a second time, following a fateful encounter with a young violinist. Anatole's passion for his music is soon swiftly matched only by his passion for this fierce and magnificent girl. He comes to believe in Zephyrine's new politics - but his friends are not so sure. Opera-singer Marie and photographer Jules have desires of their own, and the harsh reality of life under the Commune is not quite as enticing for them as it seems to be for Anatole and Zephyrine. And when the violent reality of revolution comes crashing down at all their feet, can they face the danger together - or will they be forced to choose where their hearts really lie? Zephyrine has arisen from the ashes in an oppressed society of Paris, raised by her grandmother, who taught her to be independent and fierce and to stand up for her own rights. But poverty hangs over her head like a dark cloud. Zephyrine makes up her mind to join the women's rights body and she participated in many protests against the government. But one day while standing on side of the street to sell her body to make money, she meets Anatole. Anatole who has formerly served his time in the Army is now a professional violinist, who plays for the orchestra with his partner, Marie. Anatole lives in a lavish apartment owned and paid by his famous photographer friend, Jules. One day while on his way to the studio, Anatole meets and rescues a young woman from the clutches of some vile men who try to buy her. The insurgents then soon fall for one another despite of reluctance from Anatole's friends. But politics, revolution and fight for freedom comes in between them and it becomes a struggle to hold on to each other. The author's writing is pleasant and articulate that is laced with deep, evocative emotions. The narrative is highly engaging that is both inspired from the history as well as from the linguistic changes. The story moves smoothly and as it delves deeper into story with the complications of the freedom struggle, the readers will find it difficult to turn away their eyes from this tale. The pacing is quite fast, on comparison to the fact that this is a historical romance. The characters of this book are challenging and exemplary and are extremely well-developed. The main character, Zephyrine is brave who knows how to survive with poverty and she has a vigor for the freedom and in justice done against the people and women of Paris. Similarly Anatole too thrives for freedom struggle movement along with his opera singer friend, Marie, who turned out to be a humane character, as she adopts Zephyrine to give her shelter and to teach her for the upcoming protests. Jules is another character who will surprise the readers with his ideas and beliefs. The best part of the novel lies in it's background and the era. The author has diligently captured the time frame in Paris when it came under the radical socialist and revolutionary government, following the defeat of Emperor Napoleon III. The radicalism among the working class and the pain of a regular citizen during this period on the streets of Paris are strikingly depicted. Each and every scene is written so comprehensively with in-depth layering that it will feel like the readers are standing right in the middle of a street in Paris and watching the scene unfold in front of their eyes. The romance between the main two characters is portrayed with lots of passion and emotions that will make the readers root for them till the end. The engrossing time frame along with a glittering city, the story is thoroughly captivating and intriguing. Verdict: A must read for all YA historical fans! Courtesy: Thanks to the author, Lydia Syson's publicist for giving me an opportunity to read and review this novel. Lydia Syson is a fifth-generation North Londoner who now lives south of the river with her partner and four children. After an early career as a BBC World Service Radio producer, she turned from the spoken to the written word, and developed an enduring obsession with history. Her PhD about poets, explorers and Timbuktu was followed by a biography of Britain’s first fertility guru, DOCTOR OF LOVE: JAMES GRAHAM AND HIS CELESTIAL BED, and then two YA novels for Hot Key Books set in the Spanish Civil War (A WORLD BETWEEN US) and World War Two (THAT BURNING SUMMER). 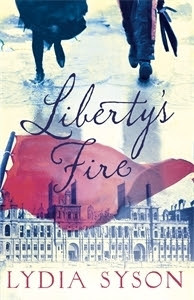 LIBERTY’S FIRE, a passionate tale of the Paris Commune of 1871, is the third of her novels to be inspired, very loosely, by family history: Lydia’s anarchist great-great-grandmother moved in Communard circles in late nineteenth-century London. From October 2015 she will be an RLF Fellow at the Courtauld Institute of Art.